"Adam and Eve lived happily in the garden. Then one day Satan had a plan. He went to the woman as a snake and said, 'Did God really say you must not eat from any tree in the garden?" God's Great Creation is a faithful retelling of these biblical events, and kids who are familiar with The Adventure Bible will enjoy the format of this book. My early reader is excited about reading Bible stories independently. I appreciate the careful attention to detail in this book, as well as the way the harsher details are presented in a gentle way, so even young children will enjoy this book as a read aloud. 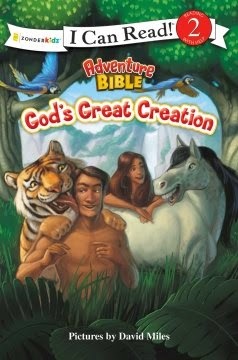 We have enjoyed reading God's Great Creation along with our Bible curriculum as we study the days of Creation. My emerging reader is able to read this without much help, and he feels a sense of accomplishment as he learns more from the book of Genesis on his own. This book provides a fun story in a fun format, a valuable teaching tool, and a wonderful resource for developing independent Bible study in young children. The pretty illustrations make the book a nice read aloud as well, so even pre-readers will enjoy it at book time!